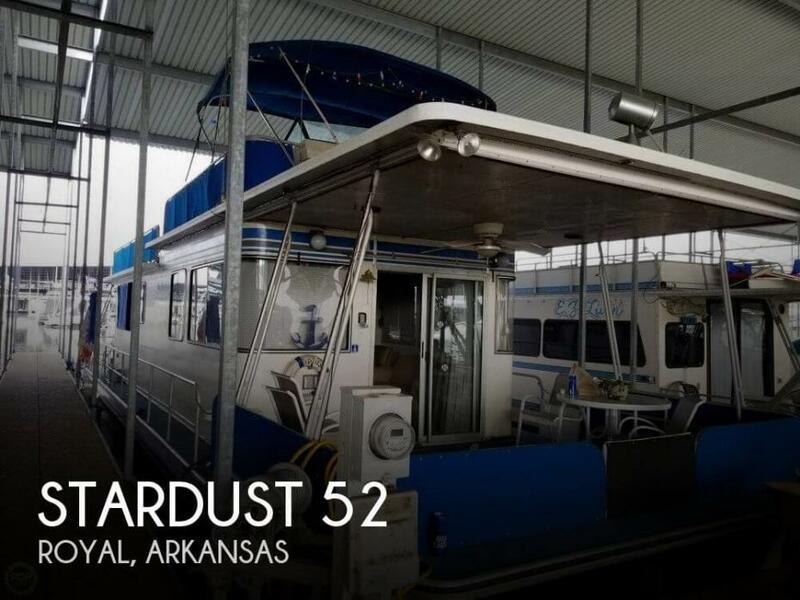 2003 STARDUST 16x80 NEW PRICE, we are ready to move!! 2003 Stardust 16X80,2003 Custom Built Stardust Cruiser 16' x 80' WidebodyWe are the second owners of this boat, when she became ours she had 23 hours on her. We have lived aboard for 11 years now, and she has given us nothing but great service and memories. We are entering a different stage of our lives so we are offering her for sale. 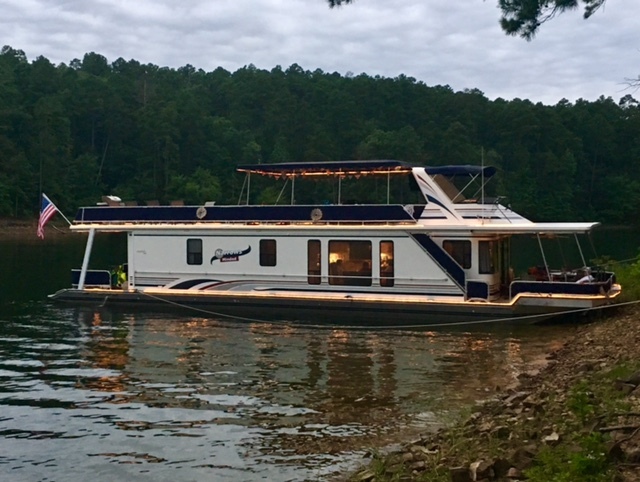 She is a Coast Guard Documented vessel with 230 hours on her Twin Mercruiser 5.0 Liter V-8 engines, Westerbeke 15 KW Generator, Stern Thruster, 2- 103 Gallon Fuel Tanks, 2 100 Gallon Fresh Water Tanks, 2 100 gallon waste tanks, 20 Gallon Hot Water Heater, 2 bathrooms with showers and Tecma Heads, Dual 50 Amp Shore Power, Swim Platform with a PWC 12 Volt wench Ramp, Battery Charger, Radar Arch, Remote Spotlight, Duel MMC Electronic Shift Control, Depth Finder, Rudder Indicator, VHF Marine Radio, CO Detector, Smoke Detectors,Flybridge w/Bimini, 24 Canvas Party Top, Roof Top Bar w/Sink Refrigerator, Hot Tub, AM/FM CD Player fly bridge and interior helm station, Front/Back Deck & Party Top Rope Lights, Canvas and isinglass enclosure for front deck3 TV's, Microwave vent-a-hood, Dishwasher, Refrigerator with icemaker, Smooth Top Range, Three Bedrooms plus a custom office, Washer and Dryer All maintenance records as well as all service manuals are included. She was last surveyed January 2011 she appraised then at 250,000. 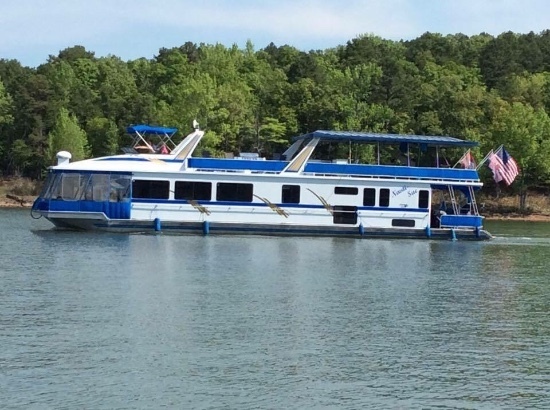 The boat was pulled and inspected with out drives serviced, new boots and shifter cables and new zincs installed October 2013.Boat is located in the Arkansas River at the Little Rock Yacht Club. 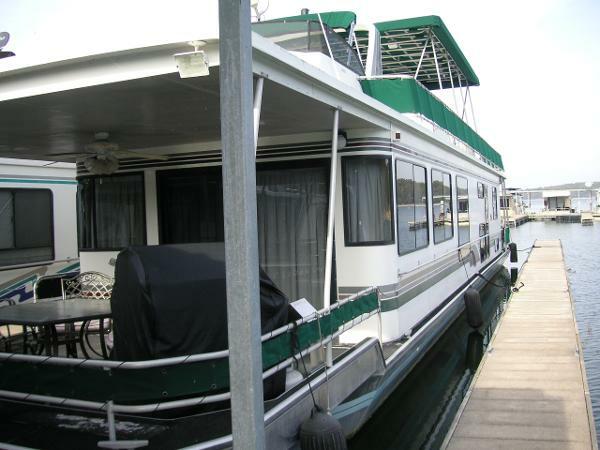 1996 Stardust Cruisers Luxury Houseboat Would you prefer to maintain a lake house or just enjoy the lake? 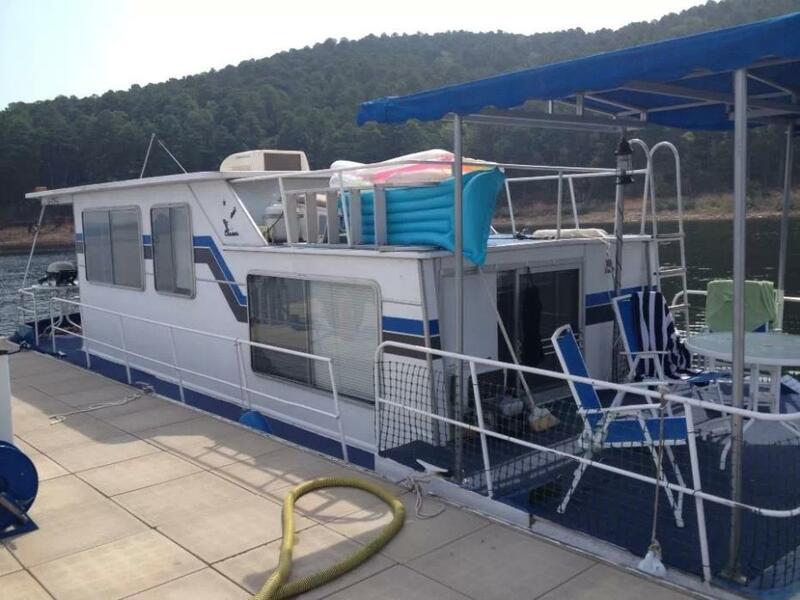 This Luxury House boat has everything you need to enjoy the lake in comfort - except a yard to mow. Master Stateroom with Queen + Two additional bedrooms - one with two queen beds and one with one fullTwin 5.0 Liter, 260 HP Mercruisers with Thunderbolt Ignition and only 360 Hours15 KW Westerbeke Generator with 537 HoursOne Bath with Head, Vanity & Shower + One Half Bath with Head & Vanity. Newer Heat and Air SystemFlat Screen TVs. 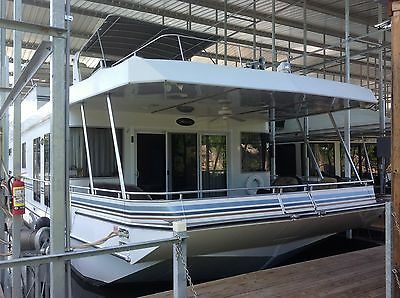 Well appointed Galley: Refrigerator/Freezer with Ice Maker, Electric Range with Oven & Trash CompactorThere is even a Washer and Dryer behind cabinet doors in the half bath Dual Helms: One on the Flybridge with moulded seating and one in the Salon. 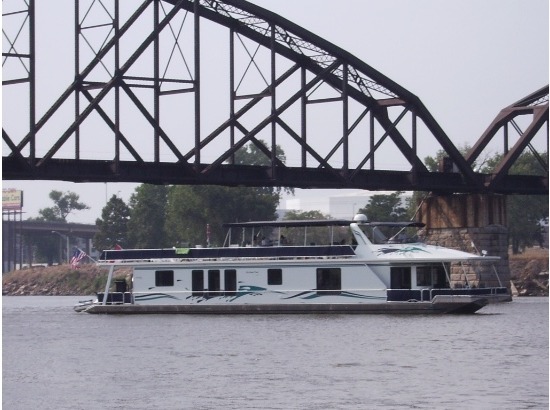 Expansive Flybridge with Bimini, Radar Arch and room for entertaining all your friends. 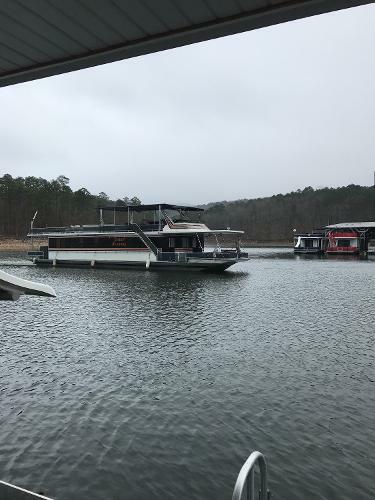 This lake retreat is Fully Furnished including Front Deck and Flybridge Deck Furniture, Salon Dining Table, Sofa, Chairs , Bar Stools, Ceiling Fans and Entertainment Center. Normal 0 false false false EN-US JA X-NONE We are the second owners of this boat, when she became ours she had 23 hours on her. We have lived aboard for 11 years now, and she has given us nothing but great service and memories. We are entering a different stage of our lives so we are offering her for sale. She is a Coast Guard Documented vessel with 230 hours on her Twin Mercruiser 5.0 Liter V-8 engines, Westerbeke 15 KW Generator, Stern Thruster, 2- 103 Gallon Fuel Tanks, 2 100 Gallon Fresh Water Tanks, 2 100 gallon waste tanks, 20 Gallon Hot Water Heater, 2 bathrooms with showers and Tecma Heads, Dual 50 Amp Shore Power, Swim Platform with a PWC 12 Volt wench Ramp, Battery Charger, Radar Arch, Remote Spotlight, Duel MMC Electronic Shift Control, Depth Finder, Rudder Indicator, VHF Marine Radio, CO Detector, Smoke Detectors, Flybridge w/Bimini, 24’ Canvas Party Top, Roof Top Bar w/Sink Refrigerator, Hot Tub, AM/FM CD Player fly bridge and interior helm station, Front/Back Deck & Party Top Rope Lights, Canvas and isinglass enclosure for front deck 3 TV's, Microwave vent-a-hood, Dishwasher, Refrigerator with icemaker, Smooth Top Range, Three Bedrooms plus a custom office, Washer and Dryer All maintenance records as well as all service manuals are included. The boat was pulled and inspected with out drives serviced, new boots and shifter cables and new zincs installed October 2013. She was last surveyed in 2012 and appraised then at 250,000. 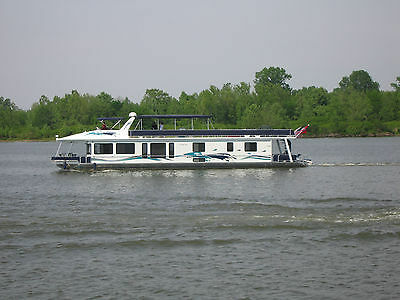 Boat is located in the Arkansas River at the Little Rock Yacht Club.